Scott Booth hailed his injured stars for helping Glasgow City battle to a win over Hibernian at Ainslie Park. Leanne Crichton's header 18 minutes from time leaves City two points clear at the top of the SWPL with a game in hand over the hosts. And Booth revealed they did so with three players playing though injury. "The players deserve so much credit for that game," said Booth. "There were three real characters that played through injuries." He added: "I won't name them. I wouldn't have used it as an excuse if we hadn't won the game. "We were able to dig in and battle through to the point in the second half where we completely controlled it." Hibs had the better of the first 45 minutes, with Rachael Small hitting the bar, while Amy Gallacher and Siobhan Hunter both went close. But City were a different prospect in the second half, with Clare Shine passing up a hat-trick of chances and Kirsty Howat denied by the legs of goalkeeper Jenna Fife. 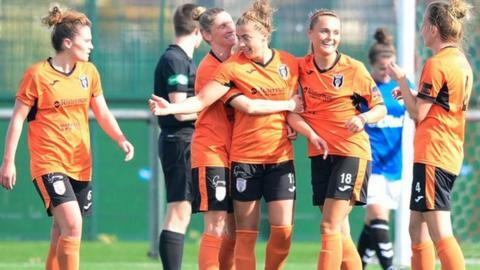 After Crichton headed in Hayley Lauder's corner, Hibs responded with Kirsten Reilly hitting the bar, while Nicola Docherty's attempted clearance ricocheted off Crichton and nearly fell into the net. Hibs head coach Grant Scott admitted his side paid the price for not taking advantage of their first half chances. He said: "I thought City had a good 20-25 minute spell but I thought we'd just managed to weather it, and then they scored. "In the last 10-15 we've given it a real good chase. It's a sore one for us, we've done very well in the game and maybe deserved a draw."